Previously unseen mechanism and component in protein that causes cystic fibrosis identified. Nearly 70,000 people worldwide are living with cystic fibrosis, a life-threatening genetic disease. There currently is no cure for the condition, however, researchers from the University of Missouri have identified a key component in the protein that causes the disease. The team state the finding may lay the foundation for the development of new medications and improved therapies. Previous studies have shown that cystic fibrosis is caused by mutations in a gene called CFTR, however it wasn’t known exactly how these mutations affect the function of the CFTR protein. It has been shown in earlier studies that there are nearly 2,000 mutations that could occur in the protein. Now, the current study has identified two amino acids in the CFTR protein that serve as a sort of gate. The team state that this gate is a key factor in regulating the flow of chloride ions, one of the key ingredients in salt, into and out of the cells through the CFTR protein. The study is published in the journal Proceedings of the National Academy of Sciences. The team explain that people with cystic fibrosis have an imbalance of salt in their bodies caused by the defective CFTR protein. Because there is too little salt and water on the outside of the cells, the thin layer of mucus that helps keep the lungs free of bacteria becomes very thick and difficult to expel by coughing. This thick mucus can clog the airways and lead to dangerous infections. Although advances in the understanding and treatment of the condition have allowed many people with the disease to live into their early 40s, the majority of patients with cystic fibrosis die of respiratory failure. In many ways, the function of the CFTR protein can be compared to a motion-activated water faucet, state the researchers. All of the parts need to be functioning properly in order for the faucet to work. The motion sensor needs to detect hand movements and send a signal to open the gate, enabling the flow of water. When the gate in the CFTR protein is defective, the flow of ions across the cell membrane is disrupted. By identifying the amino acids that make up this gate, the team say that the medical community now have a clear idea as to why a mutation in either of these two amino acids causes cystic fibrosis. For decades, therapies for cystic fibrosis worked to maximize organ function and stave off organ failure, but did not address the root causes of the disease. However, in 2012, the U.S. Food and Drug Administration approved the drug, ivacaftor, to treat the underlying cause of cystic fibrosis in individuals with a specific mutation. While the drug targets the defective protein, the actual ways by which it enhances CFTR function are largely unknown. The lab’s previous research has shown how the drug affects the CFTR protein’s gate, and the current study builds upon that knowledge by identifying the exact location of the gate. This allows the researchers to further understand how the drug works and could shed light on where the drug works, potentially improving upon its effects. The team surmise that by understanding the physical and chemical basis of CFTR function the medical community are now equipped with the tools to find ways to correct the defective protein’s function, and subsequently boost treatments and ultimately improve the lives of cystic fibrosis patients. 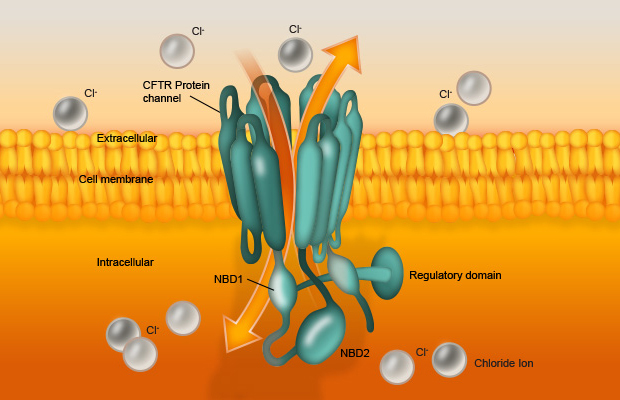 CFTR channels are found in the membrane of epithelial cells throughout the body, where they play a critical role in fluid and electrolyte transport. The channels open and close in a dynamic process called ‘gating’ to transport chloride (Cl–) and other negatively charged ions out of epithelial cells. The flow of Cl– ions has a significant impact on the ionic balance and hydration of secretions in organs including the lung, liver, pancreas, digestive tract, reproductive tract, and skin. CFTR.INFO © Copyright 2015 Facilitate Ltd.